A Fynn line between success and failure! Reed gained an important win on Saturday as they avoided the wet weather to win their 4th game out of 6 in the Herts Championship. Given the weather forecast and a wicket that would offer the bowlers some assistance skipper Heslam had no hesitation in electing to field despite missing opening bowler Jack Tidey through injury. Toby Fynn was delighted to take the new ball and immediately caused the Chorleywood top order problems with his pace and direction. It wasn’t long before he rushed opener Rose into a mistimed pull shot and then had Aspinall well caught behind by Sean Tidey. 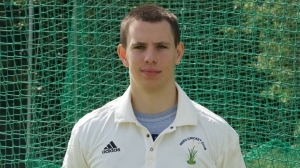 Mitchell Cooper also impressed bowling with good zip and getting a well deserved wicket as Chorleywood were set back at 55-3. The introduction of spinner Tom Greaves to the attack tightened Reed’s grip on the game as he bowled with flight and guile and alongside Fynn and Mutucumarana put a squeeze on reducing the home side to 115-6 at lunch. Reed were determined to continue the attack after the interval and Fynn (18-58-5) and Greaves (14.3-39-4) completed the job as Chorleywood were all out for 150 in 45 overs. Reed changed the batting order slightly to accommodate the declining weather conditions and despite an early loss Greaves (44) scored freely at number 3 and put on 60 with Heslam (21) for the 2nd wicket in quick time. Although both went soon after, Mutucumarana played calmly for a classy 26 putting Reed in control at 116-4. However there were rain interruptions occurring which made it difficult for the Reed batsman including not knowing how many risks to take to score the runs quickly. When Stuart Smith and Cooper were taken off for a lengthy rain break Reed were agonisingly close to the line at 135-5. However, thankfully the rain subsided and Reed were able to scamper over the line with Smith (37 not out) playing some astonishing strokes to finish the game inside 2 overs of the restart with the good support of Cooper (7 not out). Reed were the only team to win in the Championship on a weather affected weekend and have pushed themselves back up towards the top of the table. This week brings the challenge of a Langleybury team fresh from a few winter signings and having one of their best starts to the season for a while. There were even rumours of an appearance of Steven Finn, however the pre-ashes squad tour to Spain has from Reeds point of view thankfully seen to that! Reed will go into the game in decent spirits.